In the current digital age, it's so easy to simply download your images, share to social media, and then store them away in a folder on your computer forever. We love offering digital images, but also believe that having something tangible to pass down from generation to generation is pretty important too. The albums we offer are top quality, gorgeous products that will be treasured family heirlooms for years to come. The albums we offer are beautiful, modern, and expertly printed and assembled. We design layouts that are clean, simple, and uncluttered to prevent the albums from looking dated years down the road. Each 10 x 10 book has 30 pages, a linen cover, and matte-finish pages. We also offer smaller albums for parents or family members that may want their own album of your special day. Parent albums can only be ordered as an add-on to an Artbook or Signature Artbook. We have two options for parent albums. This option is for an exact duplicate of the album we design and order for the couple. This option is for a brand new album design, different than the album we design for the couple. The company we partner with has 3 different categories of cover options. While they do range in price on their end, we just charge a flat fee no matter which cover is chosen. The reason this is worth mentioning is that with Option 1 above, a different cover can be chosen, as long as it is either within the same category as the original, or a less expensive option that the original. In the image below, the covers are listed from least expensive to most expensive. For Option 1, if a Colibri Linen is chosen for the original album, the duplicate book can have any cover option. 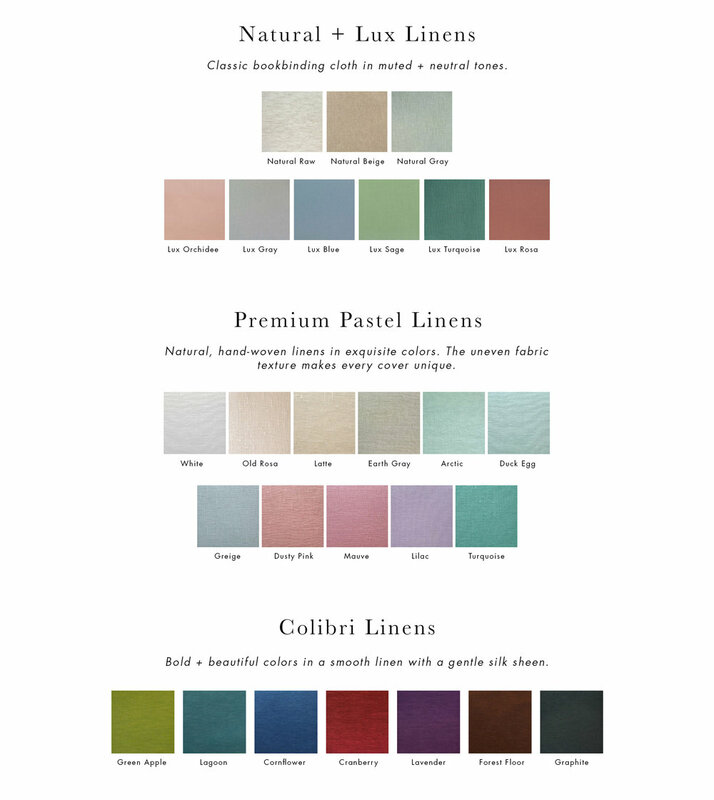 If a Premium Pastel is chosen, the duplicate can have either a Premium Pastel, or a Natural/Lux linen. If a Natural/Lux linen in chosen, then the duplicate must also have a Natural/Lux linen. Our partner company also adds + phases out certain colors from time to time, and while we try to keep our site as updated as possible, please note that at the time the order is placed, there may be slightly different options available. If you have any questions about album options, please feel free to get in touch!